Here’s how TITAN helps find the right injector for your practice. Avoid that frustration of hiring and training someone to inject only to discover that they don’t have the innate aptitude for aesthetics. 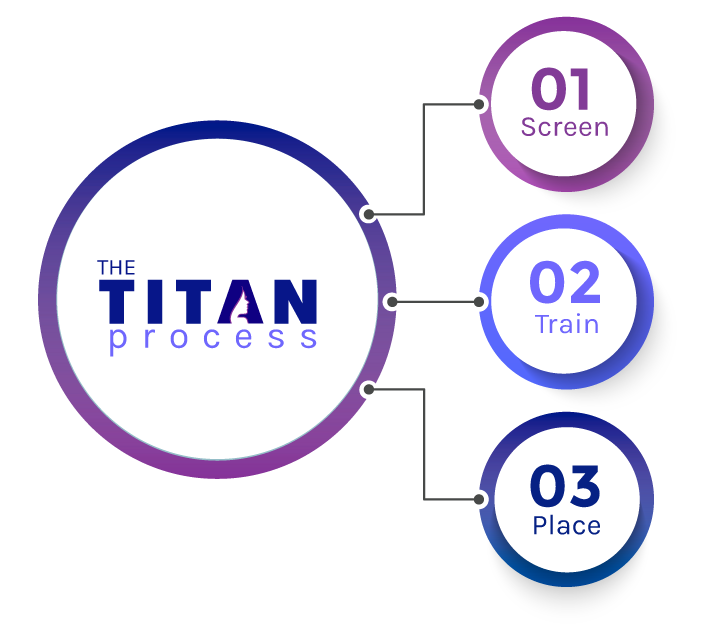 The TITAN Screening Process™ provides feedback on a candidate’s aesthetic aptitude, their ability to work in a team and their communication skills. Your personalized Screening Report also gives you management tips to get the most from your new employee. Screenings are also available “ala carte” for a $500 fee if you simply want to know more about an existing candidate or employee. All TITAN candidates come to you either as experienced injectors or with Foundational Training already completed. You don’t have to spend time or money on training and your new clinician will be ready to inject right away. 2016 ASDS survey data shows that almost 70% of consumers are now considering cosmetic treatments, so we help you choose the right candidate for your practice to meet this demand! So you’ve hired the injector and are ready for them to grow your practice…..but do you have a plan? TITAN Aesthetic Recruiting does and we customize our Injector Integration Plan specifically for your practice! We provide credentialing statements, staff suggestions, press releases, new employee tips and more so your new injector will integrate quickly! Why should I use TITAN Aesthetic Recruiting rather than a medical or nursing recruiter? How does the TITAN Process work for my candidate search? Can I use your screening services if I find my own candidate? How much does it cost for TITAN Aesthetic Recruiting to find a Clinician for my practice? What benefits do I receive after I hire a TITAN Candidate? TITAN Aesthetic Recruiting has one focus – non-physician aesthetic providers. Because the entire placement team has years of experience in the aesthetic market, we not only know great candidates, we understand the specific needs of an aesthetic clinic. We provide qualified candidates with an innate aesthetic eye who will quickly provide value to your practice and your aesthetic patients. You hire TITAN Aesthetic Recruiting to find you the right fit for YOUR office, so we start with a conversation with you to clarify your needs. There is no financial commitment unless you hire one of our candidates, but we help you consolidate your job description and think through the skills you want in a new provider. Then TITAN conducts a search for your practice or identifies candidates from our database that meet your requirements. All candidates sent to you for interviews are screened for the aesthetic eye and for the skills to help them to quickly contribute to your business. When you hire a TITAN, you hire the right fit for your practice! You aren’t just looking for an employee, you are looking for a great clinician with a strong aesthetic eye that will work well with your entire team, communicate effectively with existing and prospective patients and be a positive referral base for your practice. The TITAN Aesthetic Screening™ identifies clinicians who have these qualities, so you can spend your interview time assessing their skills, knowing that they have the aesthetic aptitude to make them valuable in your practice. We welcome the chance to apply the TITAN Aesthetic Screening™ process to any candidates! Many clinics have an existing employee that is interested in injecting or you may have found a candidate on your own, so having them go through the TITAN Aesthetic Screening is a great way to lower your risk and know if they have the natural aptitudes to be a good aesthetic provider. The screening is conducted in a 1-hour telephone call and you receive a full report and assessment within 1 hour of the screening completion. The cost for an “ala carte” screening is only $500 …..and good peace of mind. All TITANs receive discounts on aesthetic conferences and discounted fees for many advanced training courses. Check out the Advanced Training page for more information!